The opposition UPND says it performed well in the ruling party, Patriotic Front (PF) stronghold in the just ended ward by-elections where the ruling party won 12 out of 16 seats. 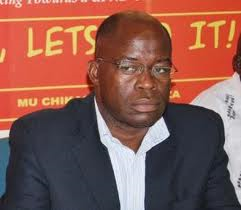 Commenting on the poll results where PF even won some seats in Central, Western and North Western provinces which are UPND strongholds, party spokesperson Charles Kakoma says the PF won by using violence. Kakoma says in a statement below that the PF blocked the way to polling stations, beating the opposition supporters. Press Statement on the just ended local government elections. The United Party for National Development (UPND) would like to thank all the people who turned up to vote for our local government candidates. We note that we have won some seats and lost others. We also note that the UPND has performed well in PF strongholds, judging by the numbers of people who turned up to vote for our local government candidates. Many people failed to go and vote because of the political violence engineered by the PF. Some roads leading to polling stations were blocked by the PF while our polling agents in some polling stations were chased by PF cadres. Our leaders such as National Chairman Mutale Nalumango were beaten on polling day. The PF also openly engaged in bribery even on polling day as witnessed in Luapula Province where PF were giving mealie meal to voters on the queue at polling stations. Under these circumstances, the elections were not credible. It appears that the PF has employed political violence as a strategy for winning elections. This is a dangerous strategy which has potential to create conflict in Zambia. If other political parties resort to violence to win elections, what will happen? Lastly, we note that PF have issued a statement purporting to have been issued by me claiming that the elections were free and fair and that UPND will withdraw all election petitions that are before courts of law. This is PF propaganda which is malicious and criminal. It should be dismissed with the contempt it deserves. I condem violence but UPND are also violent so the compliant is base less.Accept defeat. Yes, blame games, again. Yes, there were reported cases of violence involving both parties in areas of their respective influence. We should learn to convince the electorate through messages of hope, and not intimidation. We saw what happened in Mwaanza Ward of Monze. What did Mr. Kakoma say about that incident? PF used DCs to campaign using alot of govt resources, brutalised and blocked UPND supporters, so where is the fairness here. PF are just violent people because the leadership is alien and they don’t care about the true citizens of this country.